Freedom Akinmoladun is the 15th Husker football player to receive the community service honor. 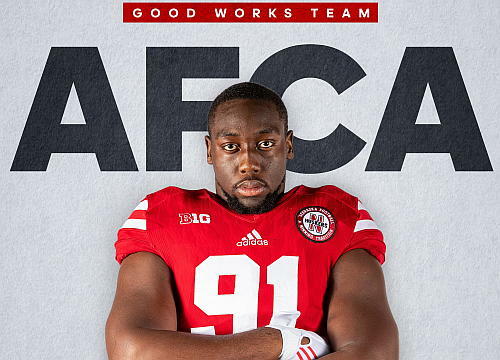 Nebraska football defensive end Freedom Akinmoladun was recognized Thursday for his work in the community as he was named to the 2018 Allstate AFCA Good Works Team®. Akinmoladun was one of the 11 football student-athletes from the FBS ranks, as a total of 22 players were selected from the FBS, FCS, Division II, Division III and NAIA ranks from 169 nominees. He is the 15th Husker football player to receive the honor since it was first presented more than 25 years ago. Prior to this year, C.J. Zimmerer in 2103 was the last Husker to earn this achievement. One of the most active student-athletes on the Nebraska campus, Akinmoladun has earned recognition on the Brook Berringer and Tom Osborne Citizenship Teams in 2015, 2016, 2017 and 2018 for his outreach work, while also earning Nebraska Student-Athlete HERO Leadership Awards in 2015 and 2016. Akinmoladun spent a week in May of 2017 in the Dominican Republic as part of Nebraska’s No Filter Outreach trip, and has also volunteered his time with Uplifting Athletes, School is Cool, NFL Fuel Up to Play 60, Husker Heroes, Husker Hotline, and local school, hospital and community center outreach visits. On the field, Akinmoladun is a three-year starter on the Husker defensive line and comes off a 1.5 sack performance in last Saturday’s opener at Colorado. With 11.0 career sacks, he could threaten to finish on Nebraska’s top-10 career sacks list with a strong senior season. Fans are encouraged to visit ESPN.com/Allstate to vote for the 2018 Allstate AFCA Good Works Team® Captain now through Nov. 23, 2018. TheTeam Captain will be honored at this season’s The Home Depot College Football Awards on ESPN. Throughout the season, fans can follow along and join in on the conversation by using #GoodWorksTeam on their social media channels.